The first thing that staggered me about this release – the only thing, to be truthful – was the timing: fully 87 minutes. The next thing of note was the recorded sound in the Venue, Leeds College of Music, which is altogether too close, lacking in warmth, hard and clangy. Whether there’s a connection between compression and recorded sound I don’t feel qualified to say but it’s a shame that the sound is so unsympathetic. 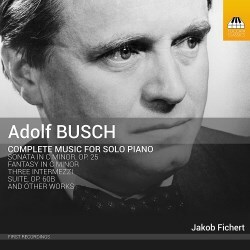 This is part of Toccata’s Adolf Busch series, which has yet to convince me that the great soloist and chamber player (overrated by European critics, underrated by American ones) was always much more than a competent Sunday composer. His complete piano music is a mix of Brahmsian intermezzi, Regerian late romanticism and some intriguing personalised touches in the Piano Sonata, which is the standout piece. To get there one has to wade through the pensive romanticism and Reger-inspired syntax of the early Fantasia in C major, composed when he was only seventeen, and the clotted but more concise Agitato where relaxation of tempo brings added rewards. The Intermezzi strive hard but not always to much effect except in those moments when expressive contrasting material makes its mark. Busch was certainly not without humour in his music as in his life and the Three Little Pieces in Olden Style attest to his playfulness, whilst there is a pedagogic intent to the Two Canons and a Little Fugue. The Sonata was composed in 1922, inspired by his meeting with the young Rudolf Serkin, later to become his son-in-law and of course his great sonata partner. Strenuous but confidently conceived in three movements it takes a few listens to get to grips with the structure, and specifically the motifs employed. The slow theme of the central movement variations would not be out of place in the 1909 Intermezzo but the thematic interrelation is well done, and Busch is adept at drollery. I assume the Kreutzer Sonata was the inspiration for this movement. The finale, an introduction and fugue, strikes a defiantly Bach-Reger note. He wrote a small sequence of piano works during his American years, character pieces and the Allegro vehemente, with a nostalgic Brahmsian B section, a touchingly rage-before-the-dying-light work for his ailing wife. The disparate Suite is alternately introvert, extrovert and sweetly lyric. By definition Toccata’s discs are specialised but there are a number reasons why this is a niche acquisition – and despite Jakob Fichert’s effective playing (and good booklet notes) there’s the wearying sound quality to contend with.